The filter chain filters variants for a single sample at a time. You can browse through all of the samples to examine the effect of the filter chain on each sample. By default, only the affected samples will be shown in the sample selection dialog, or through browsing, but this option can be changed to show all samples. Go through examining the results of the filter chain set up in the previous steps in this tutorial for all samples including the control sample. Then we will perform variant classification on the variants. We will wrap up by removing any variants present in control sample that have at least one copy of the alternate allele. On the menu bar, you should see a left navigation arrow, sample name and a right navigation arrow. Click on the navigation arrows on either side of the sample name to see how the numbers of variants that pass through the filter chain changes. See Figure 7-1. First, 10 Percent has 2 variants that pass through the filter chain. See Figure 7-2. Next, 25 Percent has 1 variant that pass through the filter chain. Finally, 50 Percent has 1 variant that pass through the filter chain. See Figure 7-4. 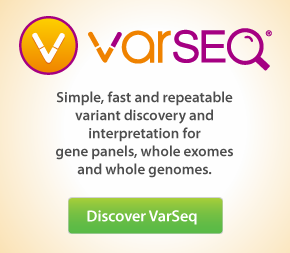 To perform variant classification (Annotate Transcripts), all we need to do is annotate against a transcript/gene source. From the menu bar, click on the Add icon and select Annotation.... 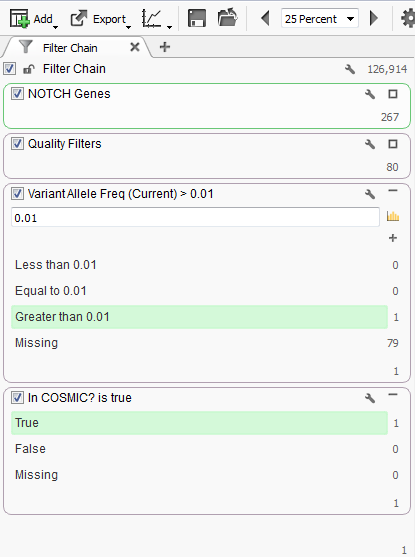 Enter in RefSeq to the filter dialog and select the RefSeq Genes 105v2, NCBI source and click Select. See Figure 7-5. After the annotation has finished, new column groups will be added to the table pertaining to variant classification and transcript/gene annotation. After hiding some column groups and columns to condense the table, you can see the new column groups added. See Figure 7-6.